This week's tablehopper: party patrol. 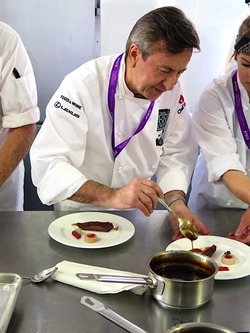 Chef Daniel Boulud plating at the Pardon My French lunch. Photo: © tablehopper.com. Why hello. Excuse me while I shake the caviar and Champagne out of my hair. No joke. Pebble Beach Food & Wine did not disappoint! It was great to return to the event after taking the last two years off. running into chef Jan Birnbaum—who is looking great—at the opening night reception on Thursday evening. enjoying late-night sandwiches from Liza Shaw of Merigan Sub Shop and Justin Devillier (NOLA’s La Petite Grocery) at the after-party. waking up on Friday morning to a tasting of eight Champagnes from family-owned Billecart-Salmon (it gave me a deeper and different perspective on the house—the freshness of their Champagnes is so notable, although it was also fun to taste the Brut Sous Bois, a richer style that is 100 percent oak fermented and aged for six months, which is not normally the case at Billecart). watching Daniel Boulud and Dominique Crenn partner up for a fabulous lunch (“Pardon My French”) that featured an open kitchen that guests could watch while listening to French crooners in berets sing and we drank such delicious wines. listening to Philip Tessier talk about the rigorous training and all the innovation that went into preparing for the Bocuse d’Or at a fascinating cooking demo—it significantly raised the appreciation for the U.S.’s first-time silver win this year, everyone in the room felt some pride at the end of the presentation. the tasting tent on Saturday featured the most insane display of caviar I have ever seen at an event (thank you, Black River Caviar, and I can’t believe I won a half tin of caviar to share later that day!). Cosmopolitan Las Vegas always hosts the best Saturday afternoon party at the Inn at Spanish Bay by the fire pits. We had fun music, a raw oyster bar with the cute Morro Bay oyster guys, stone crab flown in from Joe’s Stone Crab in Miami (!! ), and caviar from California Caviar (guess who I was sitting next to), with magnums of Louis Roederer Brut Premier. Such perfect happy hour hedonism. the finale event for me was the delicious Beauties and Their Beasts dinner, featuring Jenn Louis of Lincoln PDX/Sunshine Tavern (who blew my mind with her pasta dish—I can’t wait to read her upcoming cookbook, Pasta by Hand), Anita Lo of Annisa, Elizabeth Falkner, Stephanie Izard of Girl & the Goat, and Liza Shaw of Merigan. Go ladies! I was also so fortunate to be able to stay in my friend’s aunt’s jaw-dropping Pebble Beach home that felt like a time capsule/flashback to 1961—Don and Betty Draper would have felt right at home. Huge thanks to organizer David Bernahl and Coastal Luxury Management for throwing one of the swankiest food events—one that is a lot of fun, but also educational and inspiring. You also see so many chefs strengthening their ties, sommeliers bonding over bottles, and even us media folk getting to know each other more—it’s great community-building for all aspects of the industry. I will include a link to my many photos from the event in our Friday issue—I want to be sure I have all the captions in! In the meantime, here’s your monthly cheat sheet of five new places to check out! This week, I am looking forward to this Vivande reunion dinner with Carlo Middione, and Sunday is the Meals on Wheels Star Chefs & Vintners Gala! Nope, it just doesn’t stop. All righty then, let’s dive into today’s column.